This section contains our collection of sterling silver Celtic crosses. All of our sterling silver Celtic cross necklaces and pendants are handmade in Ireland by silversmiths who use only the finest elements to perfect each and every piece. In terms of authenticity, as a customer you can be guaranteed of the quality of the pieces as they are hallmarked at the Irish Assay Office which is based in Dublin Castle. 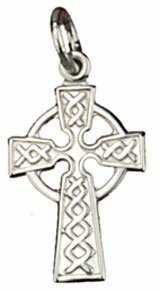 If you are looking for something more ornate, we also carry sterling silver gem set Celtic crosses which you view in that section of our website. We offer free shipping on all of our jewelry to the United States, Canada, the UK and Ireland. 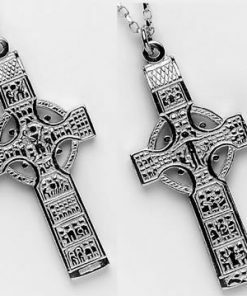 You will not be stuck for choice when it comes to choosing a piece as we have one of the largest selections of sterling silver Celtic cross pendants and necklaces available to purchase online. Looking for an embossed or engraved design? We have it. Think you might like a heavy or double sided style? We have that too. Searching for a specific cross style? From our St. Brigid’s crosses, to our Trinity Knot styles, our Claddagh designs, to our crosses using the filigree technique, you will have a wide variety to choose from. If you or a loved one have a particular association with one of the many emblems of Ireland, we have multiple options to tickle your fancy. From the Claddagh, to the Shamrock and Connemara Marble, to the Celtic Heart Knot, we have many of the unique symbols of Ireland encased in sterling silver for you to wear around your neck. For those who have a particular Celtic cross in mind, we have an extensive selection of crosses localized to selected regions. These include the Cross of Moone associated with County Kildare, to the Cross of Durrow, associated with County Laois and many more.